Last fall, Seattle voters passed Initiative 124 by nearly 77 percent. However, in late December, the hotel industry filed a lawsuit against Seattle in an effort to overturn the measure to protect hotel workers from on-the-job sexual harassment and workplace injuries. 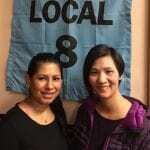 KBCS’s Yuko Kodama interviewed Abby Lawlor, Northwest Hospitality Union Local 8 representative about this matter.